A visitor had requested to know a little more about the voltage regulator I spoke of (in a post on the electricity here in Yemen). I suggested getting one if you will have American electrical products (computers, etc) for the purpose of being able to use them here (110) (as 220 is used here), but also for the purpose of protecting your products from surges/jumps in the electricity which could fry your electrical products. Here is a picture of one. This one doesn’t have a meter/needle on it. Ours has a meter so that you can see the power that’s coming in (you can see if its dipped below 220, which is helpful because then you know that maybe you shouldn’t turn on quite so much stuff at that time. Also, make sure that it says 110 on it (if you will be using American products) because some are only for 220. We purchased one that stays on for 15 minutes after the power turns off if its been charged up for around $60. What is the difference between a voltage converter and a voltage regulator? 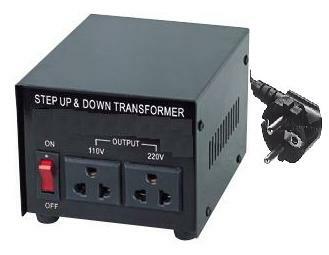 Instead of just a transformer/converter (to be able to use 110V products), you will probably want to get a voltage regulator (to convert as well as stabilize) for Yemen because the voltage currency is NOT stable here. Why does the power go off so much in Yemen? Typically, power consumers are broken up into prioritized outage blocks. These outage blocks are widely distributed across the power grid, to ensure that a large community will not experience a complete power failure. This is primarily for safety reasons; periods of extended power outage have been associated with crime and looting. In addition, the isolated outage allows people to go to the homes of friends and neighbors with electricity while the power is out. Typically hospitals, police stations, and other vital infrastructure are assigned a special outage block, and the power company will not deliberately cut power to this outage block at any time. Restoration of power after a rolling blackout can still damage appliances, just as restoration after an unscheduled blackout can. You should make sure that electrical devices such as computers are turned off during a rolling blackout, and turn appliances on slowly after a rolling blackout to avoid power surges. You should never plug a generator into the wall during a power outage, as it can send high voltage current through the power grid, potentially seriously injuring utility workers. Currently, it is estimated that only 40 percent of the total population in Yemen have access to electricity from the national power grid. Even for those connected to the grid, electricity supply is intermittent, with rolling blackout schedules maintained in most cities. Here’s a personal account of I believe a native Yemeni on the power situation which I thought was interesting (its heavy on the editorial side, but towards the end, were some good observations about the wiring and what not). (which I think I may have mentioned on a page here), it really depends where you live whether or not you will experience a high rate of the blackouts. Some neighborhoods we lived in, it was like clockwork, everyday that the power went off. It typically stays off for 1- 1 1/2 hours. In other neighborhoods, it rarely went off. And only rarely, like maybe 2-3 times in the whole 5 years has it been off for over 24 hours, probably due to a specific problem. Filed under: Electricity Woes | Tagged: electricity in yemen, rolling blackouts in yemen, why doe sthe power go off so much in yemen |	Comments Off on Why does the power go off so much in Yemen?